Mr. White began training in the martial arts at the age of eleven. Mr. White served in the United States Navy for six years. Upon his return to civilian life he opened the Manchester Karate Studio, and has since served as its director of Training and Master instructor. Mr. White is currently a 8th Degree Black Belt in the Parker system of Kenpo Karate. Mr. White received his early & current training in the Ed Parker system of Kenpo Karate from Mr. Lee Wedlake, Jr., one of Mr. ParkerÆs first generation Black Belt students. Mr. White ran a series of Kenpo techniques that completed one of the Kenpo "base move" categories. Impressed with his understanding and ability to apply the Kenpo system, Mr. Parker personally selected Mr. White to be the Technical Director for the New England region of the IKKA in 1987. At this time, Mr. White was serving as the IKKA State Representative for New Hampshire, Maine, and Vermont. 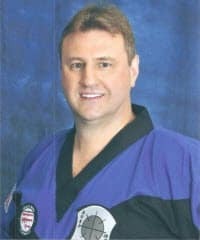 In 1989, Mr. White became the first Kenpo instructor in New England to have students complete the requirements for Black Belt in the Parker system of Kenpo. Mr. White is a Certified instructor in the Gracie Jiu Jitsu system recognized by the Gracie Jiu JitsusÆ first family and operates Northern New England first Certified Training Center for Gracie Jiu Jitsu system in Manchester NH. Ever since my 4 year old son joined Holden Martial Arts, he has developed very rapidly. He is more confident and assertive. He is respectful to his mother and grandparents and behaves very well in public. The most impressive thing I found was that he verbalizes, " I love karate! " I am very proud of his development with his friends at school and family! Our daughter recently achieved her 1 year anniversary at Holden Martial Arts and I feel the benefits of the program are so great that we renewed again. Over the past year I have seen great development in her. She has increased her fitness level and Karate skills, grown more confident, and she has become more responsible. She uses the appropriate manners daily and has become very helpful around the house with chores. I really like the "Chat on the Mat" talks. I feel many important topics are discussed and it is great for the kids to hear this information from others in addition to what their parents tell them. The instructors' attention to the skills they are teaching and having all the kids focus and learn is outstanding. This is a great program providing great benefits to my children. I cannot believe how much Ivanna has grown throughout this year. She has dealt with a lot of things in school, such as bullies, and in the beginning of the year she didn't know how or what to do besides cry and withdraw from everything. However, Mrs. Stockwell set up an appointment so that she could talk with Ivanna about tools she could use with bullies and from that moment on Ivanna seemed to have blossomed into this new little girl who became more and more confident. Every single one of the instructors has a lot to do with how well Ivanna is doing. This little girl is making friends everywhere she goes and that wouldn't be happening without her training. She has so much respect for people as well, in school, and at home she is quite the amazing girl. So I want to thank everyone there for all that they have done. They're AMAZING!